Italian Navy Frigate Carabiniere on a visit to Australia. Image via Commonwealth of Australia, Department of Defence. The government’s looming SEA 5000 decision could set the course for one of the contenders to be the leading exporter and shipbuilder in the Asia-Pacific region. Under the $35 billion Future Frigates project, the winner – BAE Systems, Fincantieri or Navantia – will design, build and sustain nine Future Frigates, with the government expecting the chosen company to develop a sustainable naval shipbuilding industry for Australia. Creating an export industry – whether it's whole vessels or parts and systems – is also part of the government's vision for a sustainable shipbuilding industry. A newcomer to the Australian defence industry, Fincantieri is already building up a name for itself in Australia as it awaits the decision of the Future Frigates contract, with the Italian ship designer working with local South Australian companies to construct three cruise ship blocks this year. 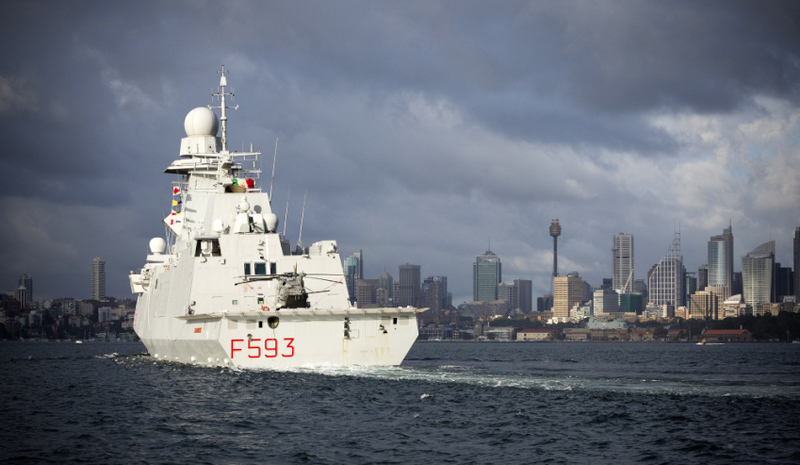 The Italian company, which has operations across four continents and 20 shipyards around the world, is focused on securing the SEA 5000 project, but is already looking ahead to the lucrative export opportunities from Australia should it secure the Australian Future Frigates project. "Fincantieri has focused on SEA 5000 at the moment within the group," explained Fincantieri Australia director Sean Costello. "That's only appropriate, being such a strategic program for Australia and being such a large program in terms of its value. "From a global point of view, Australia fits onto the map as the development of Fincantieri in this region of the world ... One focus for Fincantieri as a whole business is the Asia-Pacific, so Australia is ideal for that." The growing trend towards acquiring the latest in warships is being driven by key members of the Five Eyes intelligence alliance and is likely to continue well into the future, according to Costello, presenting ample opportunity for an Australian-lead defence export industry. "We're seeing a trend in naval technology where allied navies are moving to the capability of the Future Frigate," he said. "The United States Navy has processes underway, as do other navies; Canada, the United Kingdom and Australia. They're all moving in a single direction to having a high-end, network-centric warfare frigate that can also perform anti-submarine warfare. That's an epoch in naval technology." Fincantieri has proposed its FREMM frigate for the project, a design that is already in the water, with the Italian Navy recently celebrating the launch of its eighth of 10 promised FREMM frigates. BAE Systems has offered its Type 26 Global Combat Ship for the SEA 5000 project, while Navantia has put forward its F-5000. A decision on the $35 billion project is expected around April this year.